If’ you have fibromyalgia and have researched much at all, you’ve probably run across Dr. Ginevra Liptan. Dr. Liptan is not only a board-certified doctor of internal medicine, but she also has fibromyalgia. After spending years using herself as a guinea pig for treatments, she now has a clinic specializing in treating fibromyalgia. Dr. Liptan is also the author of several books on fibromyalgia including A Complete Fibromyalgia Treatment Guide for You and Your Doctor and Figuring out Fibromyalgia: Current Science and the Most Effective Treatments . One area that Dr. Liptan has spent a lot of time researching is the use of CBD oil for treatment of fibromyalgia. She shared some great info in a couple of videos a few months ago on using CBD oil for fibromyalgia treatment. You can watch those videos below, then keep reading for my review of her new product line. 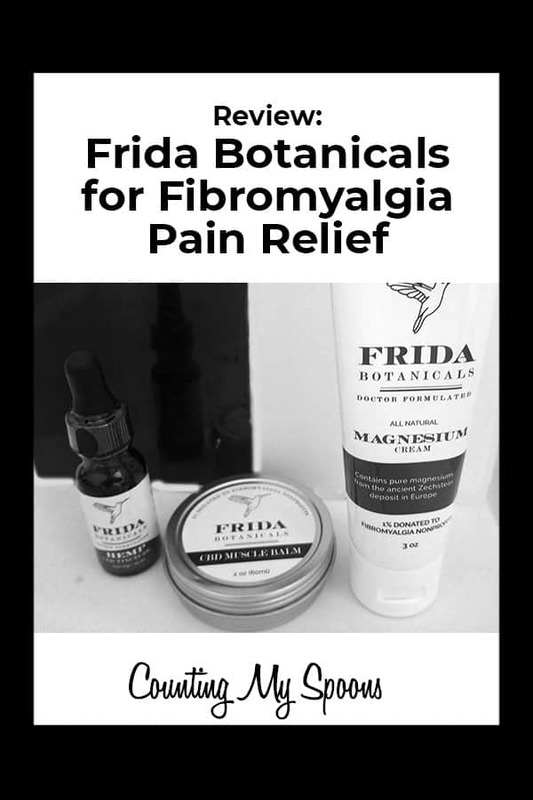 Concerned with the quality and lack of testing of many of the products on the market, she decided to launch her own line of CBD products – Frida Botanicals. Dr. Liptan sent me samples of her three new products to try. I’ve tried several CBD oil products now and have found that the quality really does vary. As such, I won’t share products here with you that I’ve not personally tried and found helpful. (If you run across a product and want to ask my opinion, feel free to email me). I received a 15ml bottle of the Frida Bontanical CBD Oil. This is a 500mg CBD oil, containing 33.4mg of CBD oil from hemp. CBD derived from hemp is legal in all 50 states. The suggested use is one dropper 1-4 times daily. In one of her videos, Dr. Liptan talks about how fibromyalgia patients may need more oil more often, taking it throughout the day to get the best effect. I’ve found that personally I see the best results taking it at night and that it makes all the difference in may ability to fall asleep and sleep well through the night. Because the oils I’ve been using were 1000mg cbd oils, I took two droppers of Frida Botanicals at bedtime and found that it definitely did help me fall asleep and sleep well. At two droppers per day the bottle lasted me about two weeks. Dr. Liptan also sent me a 3oz tube of the Frida Botanicals magnesium cream. Magnesium oil is great for fibromyalgia as it helps relax muscles and reduce pain and stiffness. This magnesium cream is great as it isn’t oily (like some magnesium oil lotions) and rubs in easily. The cream should be used directly on the areas where you hurt and you can use it as often as necessary with no risk. (The only thing I would say is that you probably want to avoid using any magnesium oil products on areas you’ve just shaved – that can burn a bit). Lastly, I received a 20z jar of the Frida Botanicals CBD Muscle Balm. This topical product combines CBD oil with arnica and 10 other plant extracts to help soothe sore muscles and joints. It applies easily and isn’t sticky or messy. You can use the muscle balm and magnesium cream together (in either order) for better effects. And, this is just what I did last week when I woke up with my hip killing me. I applied both products to the area of pain (which was pretty much my whole hip) and I did find some relief. Unlike similar salves the muscle balm doesn’t have a strong menthol smell or feel to it, and neither product seemed to create any sensation at use (where some may create a kind of icy/hot stinging). Dr. Liptan is a name that the fibromyalgia community trusts. Her advice is solid and worth taking a look at. If you aren’t familiar with her, be sure to check out her website and books. Just like everything else she does, the Frida Botanicals line of products is top notch and worth a try. Visit Frida Botanicals website to learn more about her products. I too have been diagnosed with everything you have except endometriosis but I guess I make up for it many more ailments. It seems we all have a long list that never seems to stop growing. Which CBD Oil do u like the best Frida or Every Day Optimal? They are about equal. EDO has a lot more options available (ways to take it and strengths), but Frida is adding more higher strengths so that helps even things out. I think I like the taste on EDO better, but you can always add a drop of peppermint oil to Frida to make it taste better.